In his notes … (Perpetual Night), Peter Holman declares the year 1610 as a turning point in English music. In that year King James I instituted his eldest son, Prince Henry, as Prince of Wales. Henry assembled his own household musical establishment with the assistance of his music tutor, Alfonso Ferrabosco the younger. Italian influence held sway, notably in the development of the English declamatory song, a genre derived from the early baroque monodies of Italian composers. Among the earliest works on the program are two good examples of the genre: ‘Care-Charming Sleep’ by Robert Johnson (c1583-1633), written for Beaumont & Fletcher’s play Valentinian (1610), and ‘What Tears, Dear Prince, Can Serve’ by Robert Ramsey (d 1644), most likely written to commemorate Prince Henry’s untimely death in November of 1612. Closely related to the declamatory song is the dramatic scene or dialog song. Ramsey’s ‘Howl Not, You Ghosts and Furies’, a dialog of Orpheus with Pluto and Proserpine, is an early example. Also on the program is ‘Rise, Princely Shepherd’ by John Hilton (1599-1657), a dialog of Juno, Paris, and Venus. Such compositions are not particularly tuneful, but approximate recitative—or perhaps more accurately, an impassioned arioso style. There were, of course, more overtly lyrical songs at this time, written for stage plays, court masques, or printed collections. 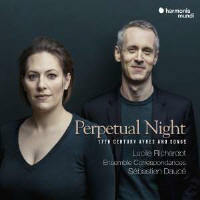 The music on this recording spans the entire 17th Century, from the Jacobean generation to masters of the Restoration period like Henry Purcell (1659-95), John Blow (1648-1708), and James Hart (1647-1718). Purcell is represented by ‘When Orpheus Sang’ (1689), an excerpt from the ode Celestial Music Did the Gods Inspire. It is worth noting that Purcell continued the idiom of the declamatory song in his secular and devotional songs as well as dialogs like ‘In Guilty Night’ (Saul and the Witch of Endor). Mezzo-soprano Lucile Richardot has a vocal quality that is nothing less than haunting. Her middle to lower range is almost masculine (haute- contre? ), but there is nothing insubstantial or weak about her head register. It is a superb vehicle for repertory of this sort. She also displays an uncanny adeptness for ornaments and divisions. Such embellishments are always crystal clear, not the blur a lesser singer would produce. Ensemble Correspondances is a first-rate period instrument group. It includes four singers in addition to Richardot for the dialog songs and the occasional chorus as in, for example, ‘Britanocles the Great and Good Appears’ (1638) by William Lawes (1602-45) from the court masque Britannia Triumphans for Charles I. My only complaint is that the harpsichord is too busy too much of the time, as if trying to upstage the soloist.